General Introduction. Reliable and Complete Knowledge. Some Issues Associated with a General Data Reconciliation Problem. About This Book. References of Chapter 1. Estimability and Redundancy Within the Framework of the General Estimation Theory. Introduction. Basic Concepts and Definitions. Decomposition of the General Estimation Problem. Structural Analysis. Conclusions. Notation. References of Chapter 2. Appendix 2 - A. Classification of the Process Variables for Chemical Plants. Introduction. Modeling Aspects. Classification of Process Variables. Analysis of the Process Topology. Different Approaches for Solving the Classification Problem. Use of Output Set Assignments for Variable Classification. The Solution of Special Problems. A Complete Classification Example. Formulation of a Reduced Reconciliation Problem. Conclusions. Notation. References of Chapter 3. Appendix 3 - A. Appendix 3 - B. Decomposition Using Orthogonal Transformations. Introduction. Linear Mass Balances. Bilinear Multicomponent and Energy Balances. Conclusions. Notation. References of Chapter 4. Steady State Data Reconciliation. Introduction. Problem Formulation. Linear Data Reconciliation. Non-Linear Data Reconciliation. Conclusions. Notation. References of Chapter 5. Appendix 5 - A. Sequential Processing of the Information. Introduction. Sequential Processing of the Constraints. Sequential Processing of the Measurements. Alternative Formulation from Estimation Theory. Conclusions. Notation. References of Chapter 6. Appendix 6 - A. Treatment of Gross Errors. Introduction. Gross Error detection. Identification of the Measurements with Gross Error. Estimation of the Magnitude of Bias and Leaks. A Recursive Scheme for Gross Error Identification and Estimation. Conclusions. Notation. References of Chapter 7. Appendix 7 - A. Appendix 7 - B. Rectification of Process Measurement Data in Dynamic Situations. Introduction. Dynamic Data Reconciliation: A Filtering Approach. Dynamic Data Reconciliation: Using Non-linear Programming Techniques. Conclusions. Notation. References of Chapter 8. Joint Parameter Estimation Data Reconciliation. Introduction. The Parameter Estimation Problem. Joint Parameter Estimation-Data Reconciliation Problem. Dynamic Joint State-Parameter Estimation: A Filtering Approach. Dynamic Joint State-Parameter Estimation: A Non-linear Programming Approach. Conclusions. Notation. References of Chapter 9. Estimation of Measurement Error Variances from Process Data. Introduction. Direct Method. Indirect Method. Robust Covariance Estimator. Conclusions. Notation. References of Chapter 10. New Trends. Introduction. The Bayesian Approach. Robust Estimation Approaches. Principal Component Analysis in Data Reconciliation. Conclusions. Notation. References of Chapter 11. Case Studies. Introduction. Decomposition/Reconciliation in a Section of an Olefine Plant. Data Reconciliation of a Pyrolysis Reactor. Data Reconciliation of an Experimental Distillation Column. Conclusions. Notation. References of Chapter 12. Statistical Concepts. A1 - Frequency Distributions. A2 - Measures of Central Tendency and Spread. A3 - Estimation. A4 - Confidende Intervals. A5 - Testing of Statistical Hypotheses. References of Appendix. Computer techniques have made online measurements available at every sampling period in a chemical process. However, measurement errors are introduced that require suitable techniques for data reconciliation and improvements in accuracy. Reconciliation of process data and reliable monitoring are essential to decisions about possible system modifications (optimization and control procedures), analysis of equipment performance, design of the monitoring system itself, and general management planning. While the reconciliation of the process data has been studied for more than 20 years, there is no single source providing a unified approach to the area with instructions on implementation. 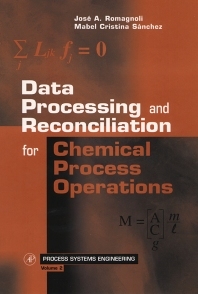 Data Processing and Reconciliation for Chemical Process Operations is that source. Competitiveness on the world market as well as increasingly stringent environmental and product safety regulations have increased the need for the chemical industry to introduce such fast and low cost improvements in process operations. Industrial practitioners and academic researchers in chemical engineering (particularly in process monitoring and control), as well as advanced (senior) undergraduate and graduate students.